No. 16224 Pte. Herbert William Lewis, Welsh R.
For most conspicuous bravery and devotion to duty during a raid. On reaching the enemy trenches Private Lewis was twice wounded, but refused to be attended to, and showed great gallantry in searching enemy dug-outs. He was again wounded and again refused attendance. At this point three of the enemy were observed to be approaching, and Private Lewis immediately attacked them single-handed, capturing all. Subsequently, during the retirement, he went to the assistance of a wounded man, and under heavy shell and rifle fire brought him to our lines, on reaching which he collapsed. 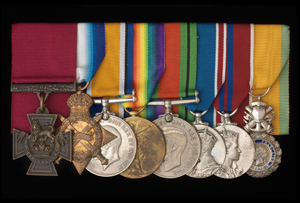 Private Lewis showed throughout a brilliant example of courage, endurance and devotion to duty.